Lisbon, the city of light, is a beautiful, laid back, unpretentious city that will keep you entertained and enthralled for as long as you’ve got. It’s the warmest capital in Europe with an average temperature of 17ºC. The beautifully renovated waterfront next to Comercio Square known as ‘Ribeira das Naus‘ (‘Ships Riverfront’), was where Lisbon’s explorers had their ships made. It’s now a public space to relax in over a drink and to enjoy the sun and scenery. Comercio Square is one of Europe’s largest public squares, and the second biggest royal square after St. Petersburg’s Palace Square. The statue of King José I on horseback has dominated the center since 1779. The triumphal arch on the north side can now be accessed via a lift and stairs for a 360 degree view of the city. Café Martinho da Arcada (1782) is worth visiting. It was a favourite of Portuguese poets Fernando Pessoa and Almeida Garrett. This award winning comprehensive tourism destination guide offers lots of information about Lisbon including what’s on, weather and other essential information. An important and unmissable aspect of Lisbon is its ceramic tiles (azulejos). This video provides a short history of them and takes you on a brief tour around the city, Sintra, the famous House of Screws and the even more famous National Tile Museum. The Lisbon information (below) is from a variety of sources – some unchecked! Get lost in the Alfama district. 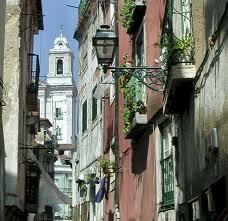 It is the real, very old Lisbon, as it’s the only district not to have been flattened by the great 1850 earthquake. The maze of confusing cobbled streets leading to the Castelo de São Jorge contain houses showing examples of (azulejo) old tiling. Look out for the viewpoint with a beautiful mosaic of the city, looking out over the Tejo river and the bridge – Ponte 25 de Abril. If you go on a Tuesday or a Saturday, then don’t miss the Feira da Ladrã (thieves (flea) market) that is held behind the Vicente de Fora church – you can even have a meal at the church’s cafe, and snack on the roof with stunning views over the Alfama rooftops and down to the River Tagus. The Graça has the feel of a small town that is separate from the city. 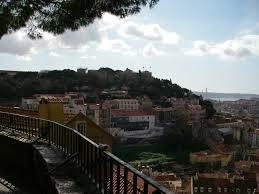 It has lots of old style restaurants and cafes and two viewpoints that offer spectacular views over Lisbon. Take the 28 tram from the city centre and travel through the narrow, winding streets. Travel past the city’s oldest building, the Cathedral (Se), the Miradouro de Santa Luzia and the magnificent Church of São Vicente de Fora. Get off at the Largo da Graça and make your way to the outdoor cafe on the Miradouro da Graça for great roof top views that extend from the Castle down to the river and across to the Estrela Basilica and beyond. Don’t forget to pop into Graça Church, one of the city’s oldest, built in 1271 with a Baroque interior and 17th century tiles. 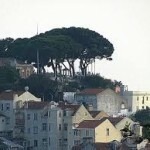 Check out Lisbon’s newest viewpoint: Jardim Da Cerca Da Graça. Opened in 2015, it’s already proving popular. If you’re still feeling energetic take the 10-minute walk up to Our Lady of the Hill Viewpoint (Miradoura da Nossa Senhora do Monte). 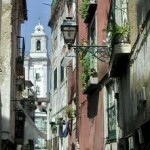 It can be reached by turning left on Largo da Graça into Rua Damasceno Monteiro, then bearing right up Calçada do Monte. The view is reward in itself. This is one of the least visited but perhaps the most breathtaking viewpoint in Lisbon providing an almost complete view of the city. There’s a small 18th century chapel, an image of the Virgin and a colourful tiled illustration of the monuments below you. Between the Baixa and Castelo is the sloping maze of Mouraria – the Alfama without the tourists and the chi-chi boutiques. Mainly African, it hums with life day and night. Walk up through the narrow streets to Graça – Lisbon’s highest hill – then head for the rooftop bar of the Albergaria Senhora do Monte. It has the finest view over the Castelo and the city. Metro: Martim Moniz, then head uphill. Albergaria Senhora do Monte is at Calçada do Monte, No 39. These districts are some of the friendliest and oldest parts of Lisbon. Some of the houses are superb. Markets often take place in the winding streets which contain small cafes and shops. Avoid the Lapa district after dark though. They’re a 20-25 minute walk to the west of the Praca de Comercio, or there are plenty of trams to Estrela and Chiado if you don’t want to walk. Beyond Estrela lies the smart, chic and self-contained district of Campo de Ourique: a grid of tree-lined streets with an almost Parisian feel, with plenty of small shops, cafes and a fresh produce market. Off the beaten track, but a pleasant (and flat) area for a stroll. South-west of here is the huge Prazeres (‘Pleasures’) cemetery, called after the nearby neighborhood (Prazeres) with the same name and has great views across the Ponte 25 de Abril. To get there take the 28 tram westwards and make sure the sign on the front of the tram says ‘Prazeres’. The National Museum of Ancient Art (Museu Nacional de Arte Antiga) is a spectacular museum with fine examples of European and Japanese art by Bosch, Raphael and many more artists. It contains the beautiful ‘Veneration of St Vincent’ by Nuno Gonçalves which is the most important painting in Portugal. One of Lisbon’s best museums is the Chiado Museum of contemporary art. It’s a great place to discover the art of Portugal’s best contemporary artists and it recently unveiled its new permanent collection. Works from between 1850 to 1975 are included and the names to look for are Amadeo de Souza-Cardoso, Almada Negreiros and Paula Rego. This does not offer a hands-on, interative experience but is a museum like they don’t make them anymore. Containing a charming and dusty old collection of fossils, rocks, prehistoric tools, etc, it feels like no-one but you has been here for years….. This is a lovely, quiet corner of Lisbon to walk around in, between São Bento and Bairro Alto. Ratton, a small gallery/shop selling hand-painted tiles by contemporary artists, including local artist Paula Rego, is at Rua Academia das Ciências 2. 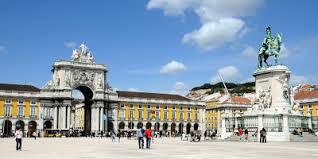 An art museum housing an eclectic collection of Western and Eastern art as well as contemporary Portuguese works. The gallery spaces are well designed and the Gulbenkian complex is surrounded by beautiful gardens. Well worth a wander through. The loveliest and probably the steepest of Lisbon’s funiculars. It was constructed by Raoul Mesnier de Ponsard and opened on 28 June, 1892. In 2002 it was designated a National Monument. It hauls itself up the Rua da Bica de Duarte Belo for 245 metres from the Rua S. Paulo (look out for the arch with the inscription ‘Ascensor da Bica’) situated in a steep-sided chasm. At the bottom, the Mercado de Ribeira has a lively fish and flower market in the mornings. The building has wonderful tiles. The Castelo de Sao Jorge. 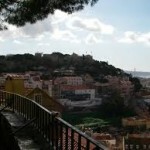 The Castelo is one of the most peaceful spots in Lisbon and has fine views over the city. 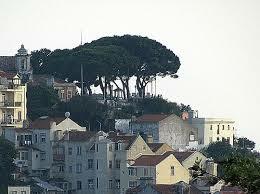 It’s built on the highest of the city’s seven hills, so can be seen from most places in Lisbon. Until the 12th century it served as a Moorish royal residence when king Afonso Henriques captured it and turned it into a royal palace. It’s a great place for a snack and to watch the sunset. Inside the Tower of Ulysses is the Câmara Escura, a periscope that projects sights from around the city. Basilica de Estrela. This vast neoclassical monument has a huge dome and a façade with twin bell towers decorated with an array of statues of saints and allegorical figures. The spacious marble interior contains an elaborate tomb of Queen Maria I, and a life-size Christmas manger composed of more than 500 figures. It’s open daily 7:30am-1pm and 3-8pm. Free entry. Tram 28 stops right outside on Praça da Estrela. This beautiful place on Rua de Sao Jorge, Estrela, should be on the itinerary of any tourist. It is very peaceful and extremely well-kept. If you are able to, go into the church also, because it’s well worth a visit. Henry Fielding the novelist and Philip Doddridge the writer of hymns, are among those buried in the cemetery. If you visit when there is a service on you will be made very welcome by the expat community. There are also some decent and relatively cheap eating places in the area. Lisbon is currently going through a gastronomic revolution that keeps on growing. The New York Times called it the city’s “Culinary Golden Age,” with creative young chefs investing in new restaurant projects since 2010. There’s no shortage of good and OK restaurants. This list is compiled mostly from recommendations. Portuguese food at its finest. As you arrive, you are installed in an ante room with antique furniture where pre-dinner drinks and amouse bouches are served. One is presented with the menu and once your meal is ready you are seated in the small adjoining dining room (ten or twelve tables, I think). The seafood is out of this world, particularly the codfish, but last time I was there they prepared a pork loin with a fennel and prune sauce that was magnificent. Very good selection of wines, both local and from other European countries. Desserts are very dangerous indeed. Metro: Rato; Open Mon-Fri 1-3pm; Mon-Sat 8-11pm (reservations required) . Great restaurant – better to go here and sit in the tiled dining room, with Iberian hams hanging up and lobsters and fish on ice, than to take your chances out on a terrace where you never really know what you’re going to get. The fish soup was the best I have tasted, and the grilled fish was fresh and succulent. A Licorista – authentic, no frills Portuguese near Rossio station. Cafe do Chiado – evening. 11-12 Rua do Picadeiro (next to Opera house on 28 tram route). 41 Largo de Graca, near Alfama. The SANTOS OFÍCIOS ARTESANATOS shop on the edge of the Baixa, near the Sé (cathedral) sells an excellent range of ceramics, linen, figurines etc from all over Portugal. The hand-painted clay figures from the north are delightful. It’s not especially cheap, but is probably one of the best place in Lisbon to buy well-chosen, quality handicrafts.